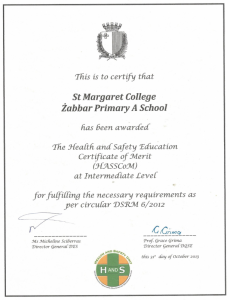 In October 2013, Żabbar Primary A was awarded the Health & Safety Certificate of Merit (HaSSCoM) at Intermediate Level. In compliance with the Health & Safety Unit, during the last scholastic year our school worked hard to promote awareness among all members of staff, students, parents and guardians on health and safety issues. In June 2012, a Healthy Eating Policy was implemented in our school and all stakeholders are encouraged to adhere to the policy mission statements, aims and objectives. Żabbar Primary A also participates in the Frott Artna Scheme. Hygiene is also given a priority in the school and informative posters on washing of hands have been affixed in bathrooms. During the last scholastic year, fire drills were held every term and all drills revealed prompt evacuation of the building. An average of five hundred students and approximately sixty-seven members of staff were able to evacuate the school in not more than four minutes. The school has a written evacuation plan and a list of Fire Evacuation Rules can be found in all classrooms. All emergency routes and exits are clearly marked and kept clear of obstructions at all times. 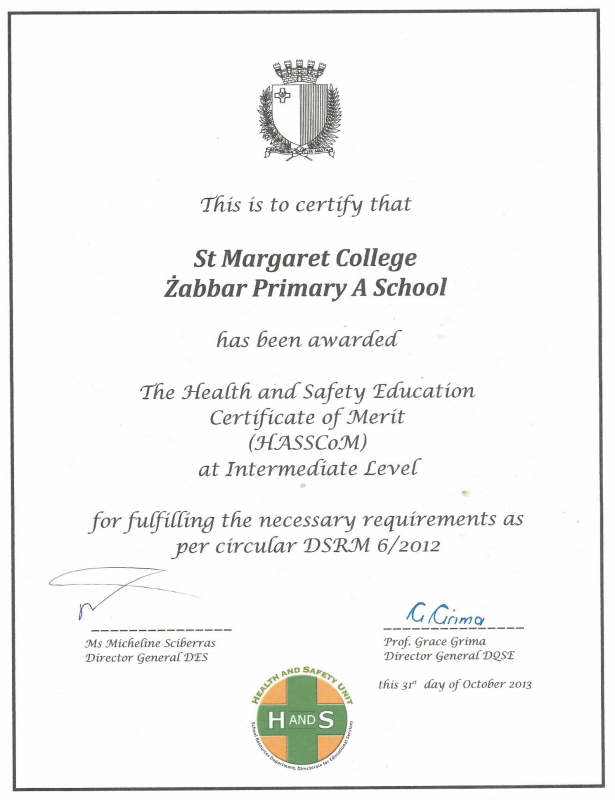 There are twelve qualified first-aiders in the school. Signage includes the nearest first-aiders and first-aid boxes available on both floors. Our school strives hard to create and maintain a healthy and safe environment. It not only deals with what is wrong and needs improvement, but it also promotes what is right and in full accordance with the requirements of a health and safety checklist.